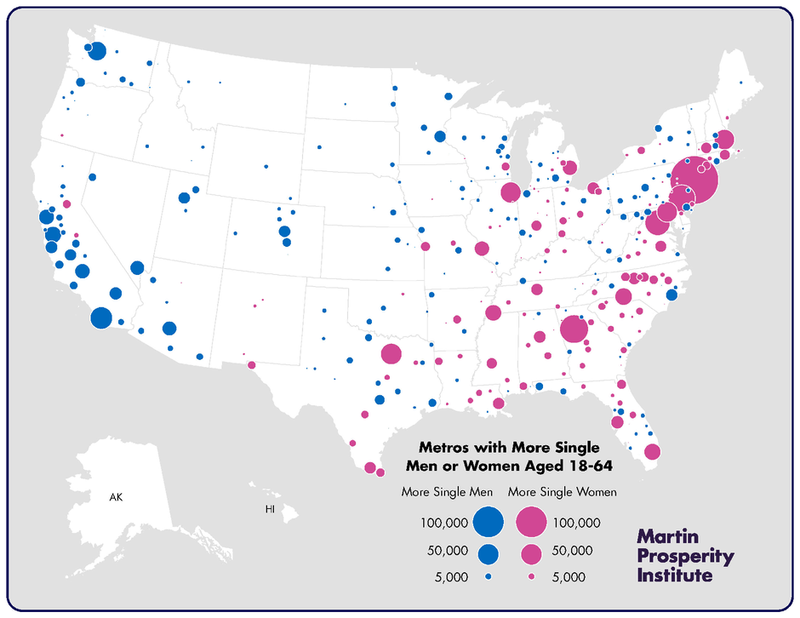 It mostly shows larger single female surpluses in the South and Northeast, and male surpluses in the West and upper Midwest. Just to underscore that point, here are the match rates in more detail. To make this I counted the matches by race/ethnicity (Black, White, Hispanic), education (BA/no-BA), and age (within 5 years) of people who were married in the previous 12 months, in the American Community Survey 2010-2012 (from IPUMS.org). 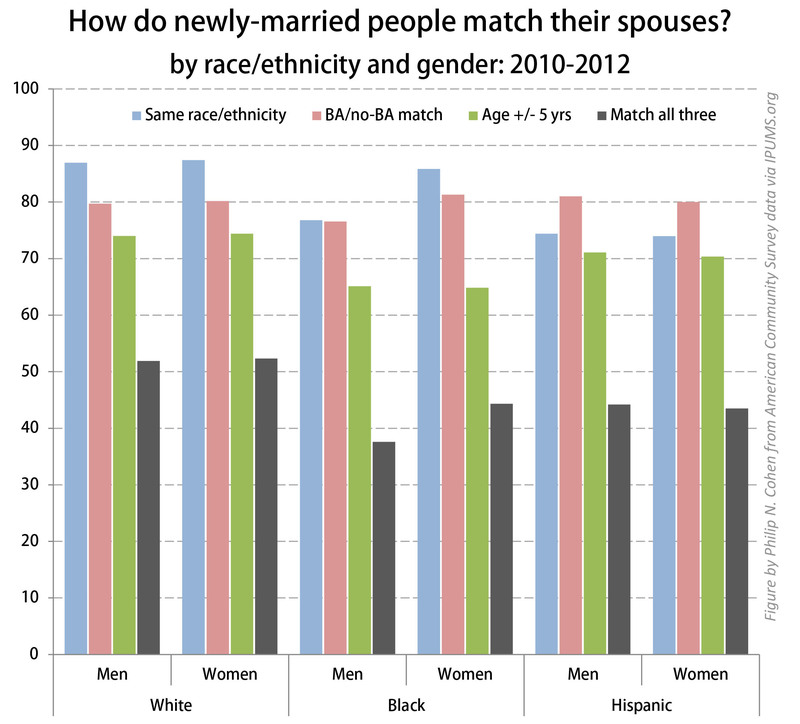 Altogether, half the newlyweds match their spouses on all three characteristics, and Whites are most likely to match. Blacks are least likely to match on age. Black women are more likely to match on race than Black men. Hispanics are most likely to match on education (mostly without BAs). Of course, lots of people don’t match on these traits — maybe even especially those adventurous types who pick up and move when they see a map like this. But whether you’re a matcher or not, before you plan your marriage-seeking move you need to know what you’re looking for (and what’s looking for you). What would be interesting is to know how much these matching rates differ from the matching rates expected if marriage was random. For example, if 90% of people had no BA, you would still expect 82% matching even with completely random partnering. If the split is 50-50, the expected match drops to 50%. And smaller groups would be expected to match less often. Not that you should be expected to do all of this extra work, but I’m just curious if it would add anything additional. Thanks. It’s pretty easy to do with the raw numbers I used (and some simplifying assumptions). But the “expected” numbers depend on the pool definitions — local, regional, national, etc.